In order to sell in India, you need a targeted email list. With this Indian email database, you can make good B2B contacts with real decision-makers. Our verified Indian mailing list has the accurate and updated information you need to create a reliable business database. India is a growing economy that is getting plenty of attention from corporations around the world. To sell in India, you need a reliable email address list that gives you accurate information about valuable sales leads. This India email list can be an easy way to find and connect with the people you want to talk to in your target audience. You can buy a pre-built Indian email database from us to get the contact information of people across the country who might be interested in buying your product. But if you would rather build your business contact list yourself, then use our online list-builder utility to create a focused India email database. From the largest cities to the smallest areas of India, we will help you to find reliable sales leads when you buy an affordable India mailing list from us. Whether you are located in India or looking to expand your company's international sales, you can buy email leads from us that will help grow your business. 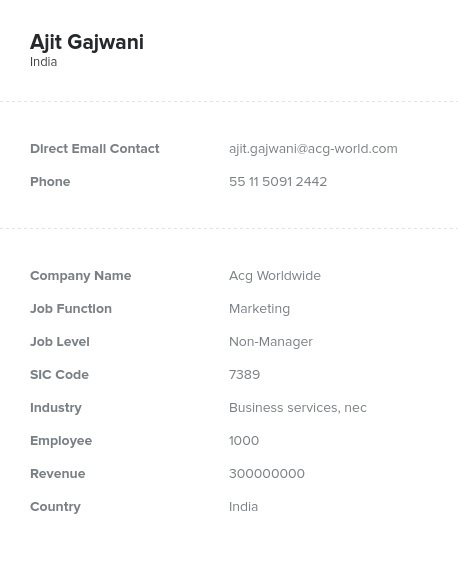 Our accurate India email list has human-verified information that you can put right into your own CRM platform. When you are venturing into a new marketplace, you need reliable email leads. With this India email database, you will have the leads you need to succeed and find the decision-makers in your target audience.